Typically, wired mouse or game controller doesn’t appear to be as convenience as wireless one but it does have advantages in terms of better latency especially suitable for gaming purpose. At the same time, it may suffer low battery issue that needs to be recharged periodically. How great would that be if the controller can be integrated by both wired and wireless technologies so that all the advantages can be merged for more effective usage? The recent patent filed by Microsoft is exactly what you are looking for. 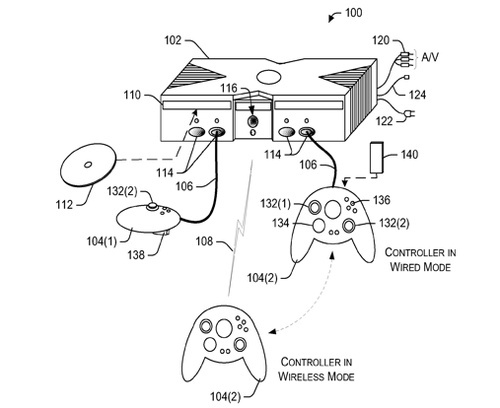 The patent filing indicated a concept of game controller that can be operable in both wired and wireless mode, allowing a much better control mechanism depending on usage. The implementation is intelligent enough that controller will be able to communicate with host gaming system and whenever certain operation or condition is detected, the switching between wired and wireless mode will happen, making the whole process transparent to users. For instance, it can be designed to switch the mode when in detection of low power condition, data packets loss, total power life expectation and so on. No indication of when the actual end products featuring this idea will be commercialized yet, but this is no doubt a great idea that can integrate additional feature into its XBox controller, and even wireless mouse devices, if extra BOM cost is not a concern.